It's "The Beach House Meets Bali"?, an idyllic oasis across the road from the lagoon and a 2 minute flat walk to the beach. Take the waterfront “short cut"? and feed the ducks on the way. Fab for families with children of all ages, pets welcome. This property is let for holiday purposes only - each booking requires a Guest Registration Form, bond and is subject to our Terms and Conditions. STRICTLY no parties or large gatherings, no bucks or hens and no smoking! Pets considered on application. Looking like a beach hut from the front, the inside house opens like a well kept secret leading to a tropical courtyard. A large entertaining deck with shaded awning leads via a wooden walkway to a self contained studio, (pass the outdoor hot shower on the way) perfect for a parents retreat or for a "getaway"? for couples with babies. Surrounded by a canopy of trees featuring an orchestra of birdsong in the mornings, the outdoor hot shower, fans, barbeque and thoughtful decoration make this area the entertaining focus of the house. Private and spacious with the occasional bush turkey and possum strolling through. Reverse cycle airconditioning makes summer cool and winter warm if needed. Maximum of 4 steps in lower part of house with a bedroom access for the elderly. The "big house" features an open plan design downstairs with a very functional, family oriented kitchen with amenities including dish washer, island bench and gas cooking. Indoor dining table seats 10. There is also a DVD player,laundry and a bathroom downstairs as well as upstairs. House is air-conditioned and has fans. Outdoor hot shower under cover on walkway joining house & studio. Studio containing BR4 - queen bed, bathroom, mini kitchen and full sized refrigerator, air-conditioned. Two nights minimum stay. 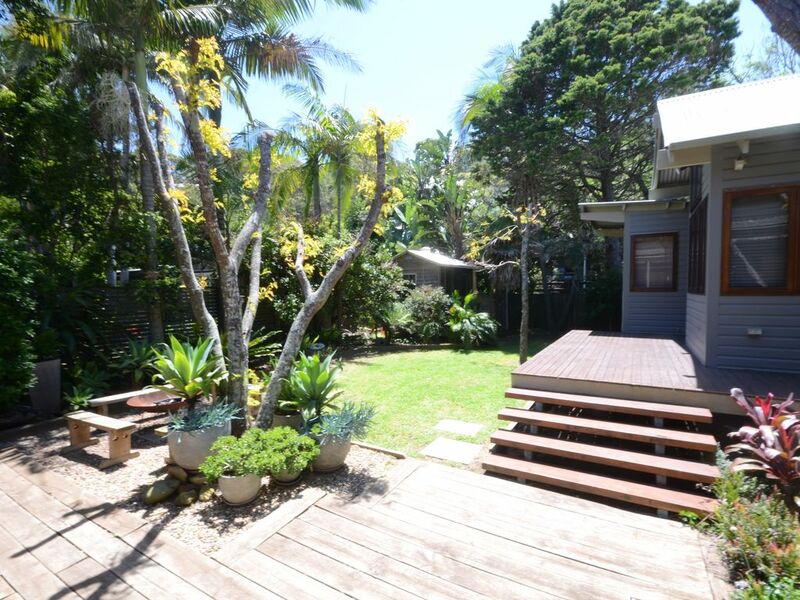 1 hour 20 minutes north of Sydney on the Central Coast between Avoca and MacMasters beaches. The property is continually updated and we have replaced the upstairs and downstairs bathrooms, renewed blinds in upstairs loft and bedroom, repolished the floors, repainted the decks, installed fans in the house and on the balcony, replaced the TV and installed a booster for better TV reception. Installed 2 water tanks for garden and general outdoor use. Added an extra bedroom with queen bed and triple bunks. Studio and house alarmed and backyard enclosed for children and pets. Clean car fanatic? Then wash your car in the drive with our tank water - feel good about your carbon footprint! We provide free Wi-fi and a printer. The Copa shops are very useful we have: mini market, ice cream shop, bottle shop, news agency with post office, hair salon and try the wood fired pizzas from the new owners at "Sirocco" on the corner. A new chemist at discount prices is our latest in the "boon". All of this is literally up the road around the bend- a maximum five minute flat walk. The local mini market also has surf boards for hire. (The house has 3 boogie boards for your convenience). No car needed here as the property is located on the lagoon side of Copa. The flat walk to Cochrane Lagoon and the surf of Copa or the adjoining beach of MacMaster's are accessed across the road. This area is also sheltered from stiff ocean breezes which means you can cross the road and feed the ducks at sunset in comfort. Surfing, swimming in lagoon across road or sheltered rock pools at Copa or MacMasters or simply stroll the sands. Get fit walking the hill to Copa lookout and read extracts from Captain Cook's logbook on his travels in the area. Watch the whales pass in whale "season" - June/July. By car, lots to see along the coastline, for example, south to Kincumber, have coffee and see the Arboretum at Pearl Beach or just wander tucked away bays. The hourly ferry service from Ettalong or Wagstaff is bliss for when you need to get out of the sun. Brisbane Waters can also be wandered by small ferries. Rather fun to catch the ferry to Palm Beach from Wagstaff and do a "gal's" spot of shopping. Gosford Regional Gallery at West Gosford has great Japanese Gardens, coffee shop and of course, gallery and gift shop. Gallery 460 near Kincumber has a gallery and huge sculpture park definitely worth a visit. The coffee shop at the Surf Club - Bar Copa serves excellent light meals, and there are many more 5 -10 mins drive at Avoca and Terrigal. Fisherman's Wharf at Woy Woy is good for seafood and pelican feeding times are worth watching. Movies at Kincumber. Avoca and Erina Fair. the restored Avoca Theatre is an attraction by itself. ** All doonas and pillows provided. Linen is not supplied for this property. For your convenience LINEN PACKS (flat sheets, pillow slips, bath towels, face washers, bath mats, hand towels) can be purchased; please inquire when making your booking. FOR YOUR ADDED SECURITY, "Copa Beachside" IS ONLY MANAGED IN AUSTRALIA AND WE NEVER REQUEST PAYMENTS BE MADE TO OVERSEAS ACCOUNTS. We booked the house for our extended family reunion and it was just perfect. We used the paddle boards to explore the lagoon near by and saw plenty of birds and fish. The house is well vented that we didn't have to turn on the air conditioning. The kitchen is well equipped as well. We absolutely loved our time at Copa beachside. We will definitely be back. Thank you Jess for responding to my after-hour SMS, as well as a prompt refund of the security deposit. We enjoyed our stay at Copa Beachside but did encounter a few issues with a couple of things. We found it well equipped but a couple of things were not in good repair and we needed to fix them to be able to use them. Excellent location, large house, plenty of room, very comfortable. Very short walk to the lagoon, the beach and the shops. Very quick and peacefull place. we had a great time. The house has everything what you need. just overall needs spring cleaning. We loved our stay - 2 families, 2 dogs. Had a beyond wonderful time, beautiful rooms, plenty of room for all of us. The kitchen is the MOST well-equipped kitchen we have every holidayed at. All sorts of games are available if weather is poor. The backyard looks like a scene out of Bali - so lush and beautiful. The self-contained unit out the back is amazing. There are soooo many beds in this house.... then they've each got a mattress under each bed! Short stroll to dog-friendly lagoon, turn left to Copa flags, turn right to McMasters Flags. Tame ducks come to the door each day for a feed. Completely forgot to write in the beautiful, rustic guest book. Obviously people revisit this beautiful house, going by the guest book. We will be going back for sure! Thanks to Jess for your communication at the office. Dear Paul A little late but I still wish to thank you for such a great guest comment. It is much appreciated as we really do try and not often to people express a verbal thank you. So many thanks, lovely to hear and all the best. Julie Byrnes, Copa Beachside. We stayed as a group of 10 for our end of school trip, and I'm glad to say that it was overall an excellent experience! We all had a great time- Copacabana is a beautiful place and the property is well situated. Jess, the property manager, was contactable at all times and made sure any problems were fixed immediately, which gave us peace of mind and a comfortable stay. You need to be aware of some things though- basics like toilet paper, dishwasher tablets, salt/pepper and wipes/tissues/paper towels are minimal and we had to restock these things ourselves. Some of the crockery/utensils weren't in the cleanest condition (although we just chucked them in the dishwasher which wasn't a problem) and the couch was sandy. Overall, it was an excellent stay still and I would highly recommend Copa Beachside! Thank you for having us! This house is fabulous with more than enough room to accommodate the family, beautifully decorated and a very short walk to the lagoon and beach. Highly recommended.